[...] AK: At times, Swami takes the boys out on a picnic, where He almost plays with the boys. Sometimes, He even sings with the boys. All sorts of funny things happen. GV: Does it all remind you of Krishna and His cowherd boys, the Gopalas? AK: Yes, I think it is all action replay, like a tape being replayed. GV: Except for the age difference between the physical body of the Lord and those who are with Him this time? AK: May be, but Bhagavan crosses all time barriers when He materialises certain things. I know Sir, one year He materialised the ring worn by Lord Rama that was presented to Him by His father Dasaratha. GV: Oops! 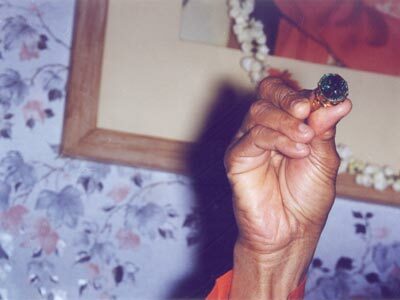 The ring that Dasaratha gave?!! AK: That is right. It was a diamond ring, and Swami was smiling as He looked around while materialising another ring – this time it was a sapphire ring that was presented to Lord Rama by His father-in-law, Emperor Janaka. GV: I am told these rings are very big? AK: Very big indeed. I said, “Swami, it is almost the size of my wrist. How come this ring is so big?” Swami replied, “Lord Rama was an Aajanubhau, meaning one of very tall stature. GV: Eight feet or so? AK: Yes, Swami then materialised the Mangalsutra or sacred wedding medallion, complete with the sacred thread that holds the medallion. This was worn by Mother Sita at the time of the wedding. I have also seen Swami materialising the chain worn by Ravana. AK: Yes, complete with 365 Shiva Lingas and a pendant at the bottom made up of three large Shiva Lingas, one yellow, one green and one blue. All the 365 were made of gold while the three in the pendant at the centre were made of crystal. This was the chain that Ravana wore. GV: What happens to these jewels afterwards? AK: They go back to SAI STORES (laughter). Swami also materialised a golden replica of the deer that captivated Sita, later landing her in trouble. GV: Are you allowed to touch these objects? AK: Yes, sir. On one occasion, Swami said, “Tomorrow is the wedding function of Balarama [brother of Krishna] and Revathi. All of you are invited for lunch!” Sure enough, on the following day, there was a fabulous lunch and in the afternoon Swami spoke about the marriage of Balarama with Revathi. And at the end He materialised a magnificent diamond-studded necklace with three or four rows of diamonds. GV: My GOD! How big was the necklace? AK: About 15 cms. At the centre of the arch-like necklace there was a Swan suspended by a gold chain. The Swan was clear and you could look through its eyes, beak, stomach, and so on. Every body started looking at it. Swami came to me and said, “Look, look deep”. I did so and there in the middle of the stomach of that bird I could see Bhagavan Baba in a reclining posture, the classic reclining posture of Lord Narayana, reclining on His Thousand-hooded snake, Adisesha. That is what I saw. It was absolutely fantastic. 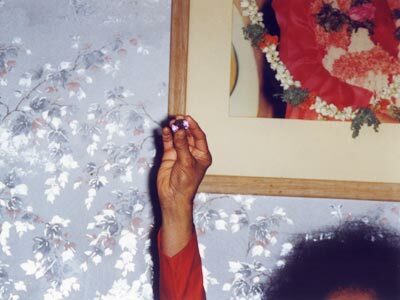 Swami also materialised the CHOODAMANI or the ornament that Sita used to wear on her head. This was the CHOODAMANI that Hanuman brought back as proof of having met Sita, when he reported back to the Lord Rama. GV: How do the boys feel on such occasions? They must be transported to a different world.